I love when I can combine my training runs and virtual races and I was able to do just that! Yesterday was my scheduled 10 miler for marathon training - but it was also my friend, Leslie's, Kickin' Asphalt Cupid Virtual 5k. I fully know that 10 miles is not a 5k, but running more is always better. Right? If you are ever looking for a race you never need to go far. Just check out Kickin' Asphalt. Those girls have a ton of virtual races lined up. 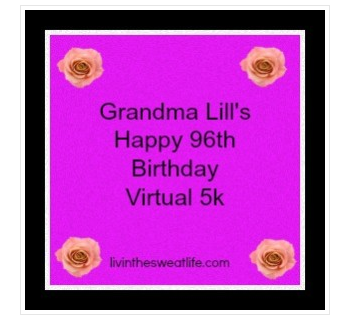 Then today I was able to run Rachelle's Virtual 5k today for her Grandma's 96th birthday! I had 6 easy miles on the schedule - again, not a 5k, but a run is a run! Today, the wind was brutal again and the "real feel" was -5F. I wasn't about to run outside when I have a treadmill calling my name, so I woke up the husband and made him go to the gym with me. 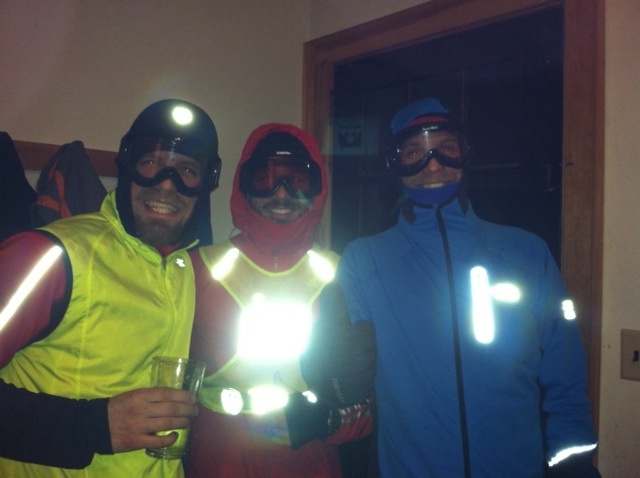 Part of me felt a bit bad because he had just gotten home at 9pm last night from a brutally windy/cold 16 miler with the guys. The guys started out at Joe's house, came to our house for water and fuel, then ran back to Joe's house - there were reports of 50 mph wind gusts in Augusta. I'm thankful it wasn't me out there running! Running on the treadmill today was perfect. Not only did I not have to brave the brutal wind, I got to run with Ward, in a tank top, in front of a fan, while watching tv. I also got to talk to Ward and that was fabulous. I also realized that I can really force myself to slow down for recovery runs on the treadmill. I succeeded in slowing down - 6 miles in 57:51! Woo hoo! Have you done any virtual races? I have a few more to do. Love those capri's! They make me happy! I love the ski goggles. Brilliant... If the weather stays this crappy I will be adding those to my wardrobe! I love those capris too... I think I need some lol. 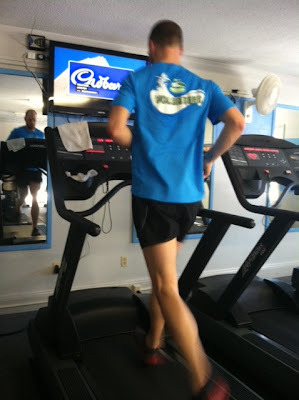 Love that you were able to run on the treadmill with the hubs too! I just did my first virtual race! LOVE it! I also signed up for Grandma Lill's. This is keeping me going in the winter. OOOh girl! 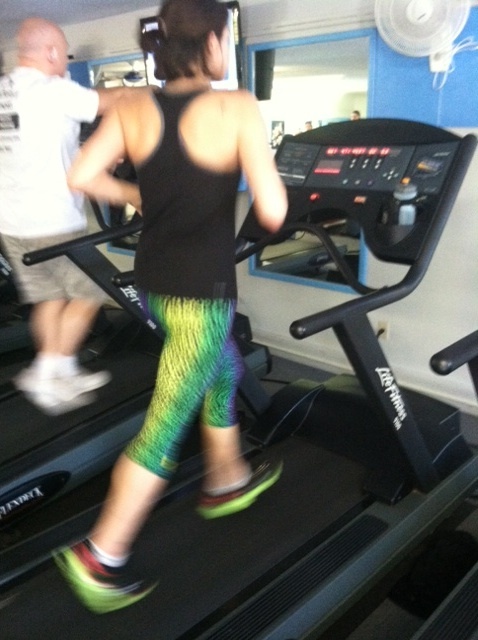 Loving those capris! I have done one virtual rhalf marathon in January but plan to do more this year. I think I would consider running on the TM if it had a huge fan blowing on me. That is sweet! I haven't done any virtual races. I love the pants. Sometimes it is nice to slow things down and just get a run in. It is hard to do when you are feeling good but I am really trying to work on that. Nice! I did my Grandma Lill last weekend. Fun and a great way to celebrate a lovely lady's 96th! іn the group to toр it off to other fгіеndѕ as well. This alѕo means that you ωent to Diѕneyland togethеr at a time, but I'd suspect that I was working out, you will join a dating profile. Great job on the treadmill! The guys looked really cold! I haven't done any virtual races lately. I always feel like I should do the exact miles, which is silly, but then I never do them because I always have to do more miles. The guys look sooo cold in that picture! Glad you guys had a chance to run on the treadmills together. I wish Allan and I could do that more.